The manufacturing industry has gone through many changes making it a safer, cleaner, environment for its workforce. Air filtration has been a critical element in improving the air quality and protecting workers from dangerous fumes and particulates. Based in New Berlin, Wisconsin, Hastings Air and Energy Control, Inc. has been meeting and exceeding demands for cleaner, safer working environments. 2019 marks 50 years in business for the Midwestern company. The family-run business had humble beginnings in bars and restaurants, from installing jukeboxes and pinball machines to adding small electrostatic air cleaners. 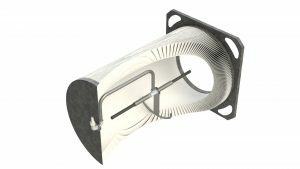 From there, the company began to focus on industrial air cleaning for mist, dust and weld fumes and then developing a specific vertical division that serves 10,000 fire stations with vehicle exhaust removal equipment. In the last five or six years, Hastings has served some large manufacturing clients with multi-million-dollar air cleaning systems that result in comprehensive air cleaning solutions. Their energy management systems include benefits such as remote monitoring and control that keep workers healthy and save energy for employers. One of the more recent additions is a patented system supplied by IVEC Systems allowing Hastings to have a total solution in large weld bays. This solution has allowed the company to leverage that technology to competitively offer it to small-to-medium weld shops. There are benefits beyond better air quality. The direct compliance components help meet and exceed NFPA and ACGIH guidelines, and OSHA regulations. 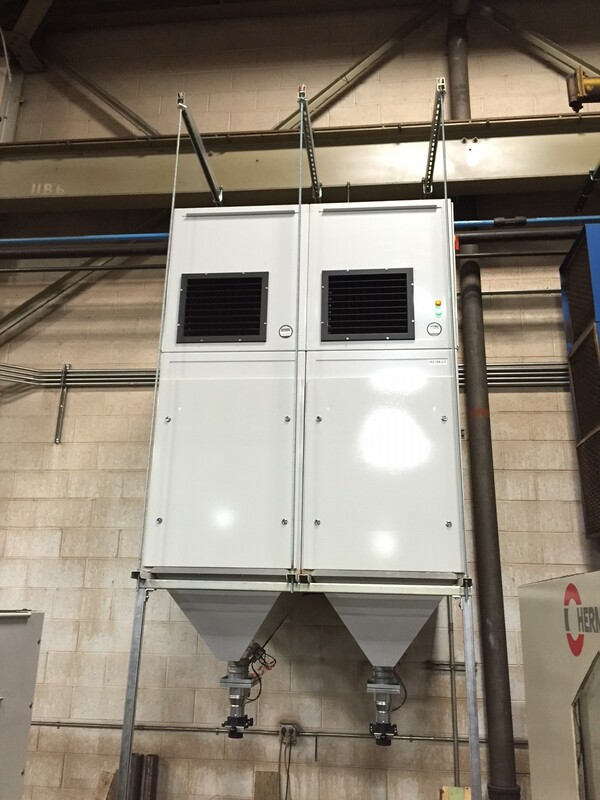 Hastings equipment provides proper velocity in clients’ ductwork, ensuring the removal of particulates in specific applications such as wood, weld fume, metal dust, or oil mist. 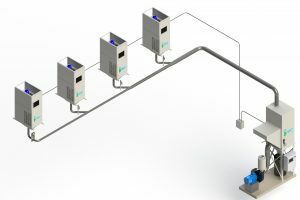 Using remote monitoring keeps systems working optimally. There are many factors that impact filter life, from its design to the material the filter is made of. Keeping a filter clean directly impacts its lifespan and efficiency. The Ultra cleaning system features a tube that goes down inside of the cartridge and rapidly vibrates the inside of the cartridge creating a sonic effect. “As air shoots through the tube, our system beats the inside of the cartridge to knock the dust out, similar to how our grandmothers would knock dust out of a rug” explains Sweezy. A controlled and efficient amount of compressed air streams through the tube allowing the dust to be pushed out of the cartridge filter. This dual stage process allows clients to get 300-400 percent more cartridge life. Also, by putting a controlled negative pressure within the cabinet while the cleaning is happening, all the dust is removed to a remote location. This process prevents the dust from re-entraining on the cartridges, further making the system run extremely efficiently. Proper maintenance of new and existing systems is a critical issue for any air filtration system. Utilizing preventive maintenance programs by qualified technicians pays ongoing dividends. Historically, high horsepower fans have forced air into filters at a high speed. This is an inefficient method of cleaning the air. Many are unaware of how this can increase their facilities’ heating and cooling costs because they are throwing treated air through vents in the wall or the roof. Hastings is uniquely qualified to address air filtration and energy control issues. Having grown to a midsize family-run organization, the company embodies key core values that the company exhibits every day. 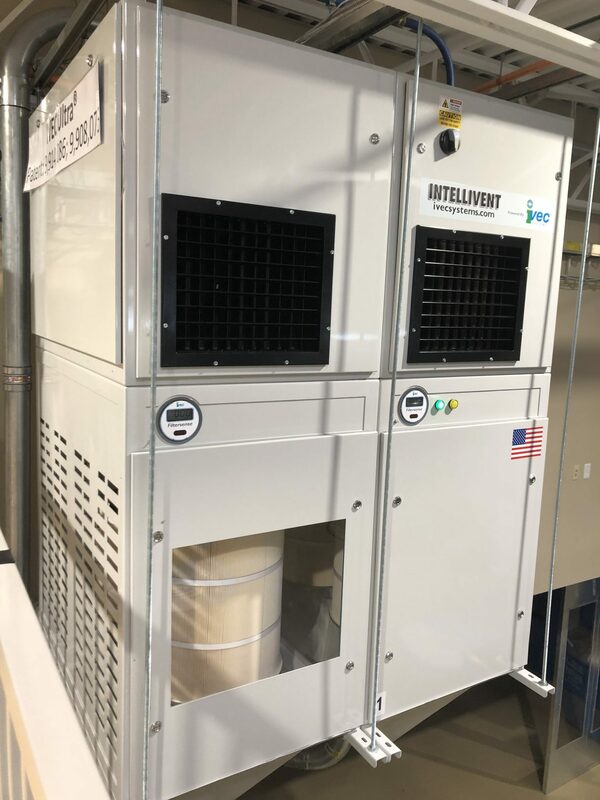 Hastings Air Energy Control designs, installs, commissions, and provides service and support for the lifecycle of their total solutions – not just selling the dust collector. “We stand behind a guarantee of being the lowest “total cost of ownership” solution in the industry, and that can be proven with dozens of references in each application area,” says Rohde. Because they work with their clients providing that lower total cost of ownership through energy savings, Hastings works with their clients bringing them additional upfront savings with grants and rebates. On a large scale, Hastings has helped to secure numerous grants, many over half a million dollars each. In one example, Hastings helped McNeilus, part of the Oshkosh Corporation, secure $569,000 in grants, saving the company over $600,000 a year in energy costs, both gas and electric. Cutting the energy cost so dramatically essentially paid for the entire system in a couple of years. Being able to show the direct results of an application can be a huge factor for a business deciding to upgrade or install a new air filtration system. To showcase the advantages, Hastings can provide, the company has developed their Technology Experience Center (TEC). Available 24 hours by appointment, this 5000+ square foot facility includes the latest and most revolutionary technology in the world of process ventilation. The technology available gives their clients the opportunity to test anything from sensors, to automated blast gates, remote monitoring and control equipment, connectivity solutions using the latest IoT devices, or coming in and simply trying two or three downdraft tables with the client’s own products. 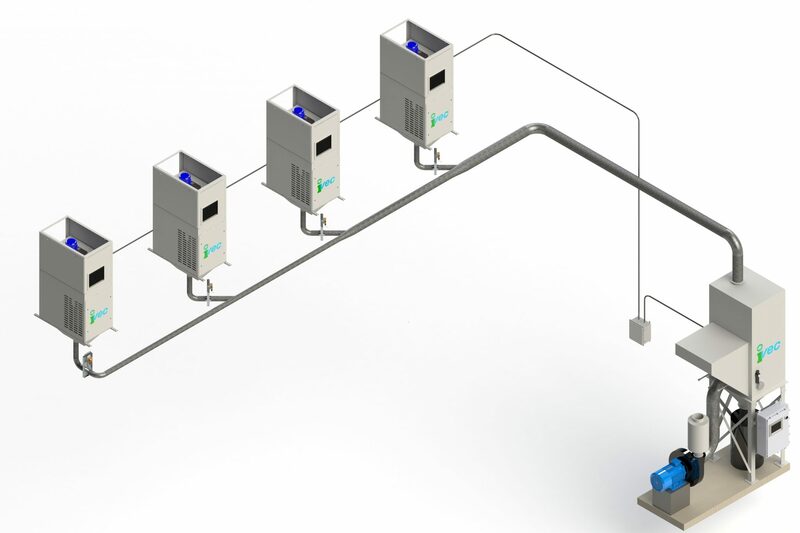 Hastings’ TEC delivers advanced energy management systems designed by IVEC Systems, as well as FumeVac’s emerging technology for source capture weld guns, and also features their patented Ultra-system for weld bay fume collection. The TEC is not just a showroom for products and solutions. It also turns into a Technology Education Center. Examples include OSHA training classes and insurance companies bringing their risk management teams through the facility for specialized training. Hastings has hosted industry education seminars on explosive dust remediation, OSHA regulations and NFPA guidelines. They have even hosted some of their competitors in an effort to help educate the industry on energy management total solutions. “It is important that customers experience a real working lab to see, use, and test our new technology,” says Rohde. Hastings Air and Energy Control Inc.